Get into party mode with pups and cats who know how to have fun. 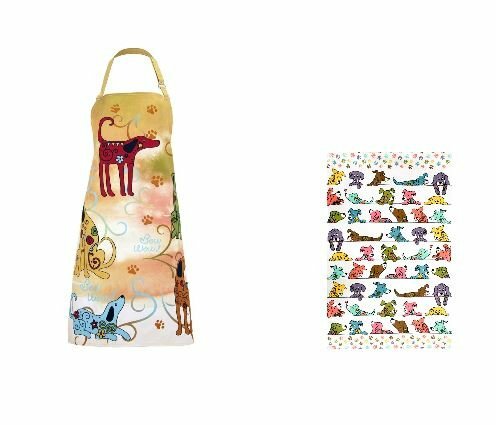 Swirling colors, festive flags, paw prints, and pooches or cats with plenty of heart abound on our tasty cotton canvas apron. Bow-wow and meow! Makes a great gift for any Animal Lover! Add a splash of color in the kitchen, and show your love for animals. 100% Cotton Apron measures 33" L x 26"; Cotton towel measures 18" x 29"
Metal D-rings for adjustment around neck; Ties in the back at the waist. Makes a great gift for the Animal Lover in your life. View More In Tabletop Accessories. If you have any questions about this product by Animal Rescue, contact us by completing and submitting the form below. If you are looking for a specif part number, please include it with your message.